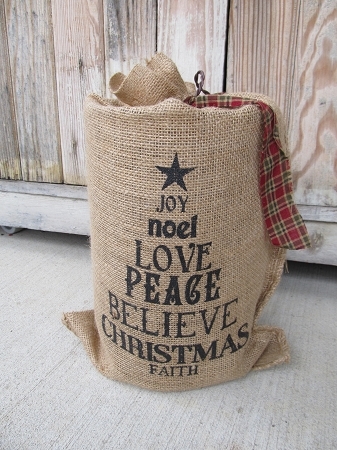 Primitive Burlap Christmas Word Tree Light . I love burlap and love this light. A burlap bag has been transformed into a soft glow from an accent light. Burlap has been printed with a picture of a tree but made up with words. Joy, Noel, Love, Peace, Believe, Christmas and Faith. A String of brown lights are inside with a long cord. Size is 13" x 6". Only 1 Available.